Some of my favorite moments on my treks around the world have been with people that I didn't know prior to taking the trip. From turning up in mosh pits as Rae Sremmurd performed "Black Beetles" in Los Angles to popping gold champagne bottles on a yacht in Dubai, I've been fortunate enough to strengthen friendships and make new ones while sharing the mutual goal of having an amazing time. Outside of #PleaseBelizeMe I haven't been on a vacation that was comprised more than a dozen women in one place. 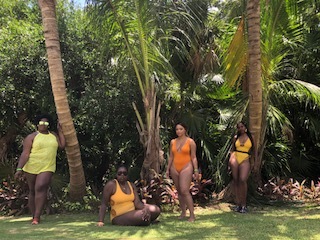 When approached with the idea of Baddies and Bosses Take Tulum by Sydney of The Baddie Brunch Series and Sade of The B is for Boss I recognized this would be new ground for me if I agreed to this retreat but after hearing their ideas and purpose I was in. Baddies and Bosses Take Tulum was the first collaboration between the two friends who met while attending The University of Texas at Austin. 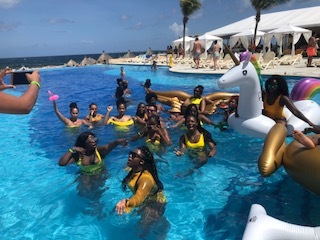 Having built successful brands in their respective cites and across many states they decided to not just take their talents on the road but on a plane for a three-day networking retreat for ambitious female professionals. 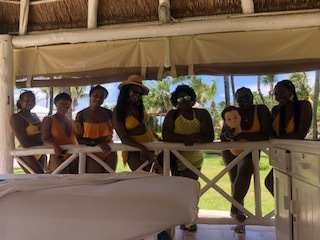 Over 30 women embarked on a journey for an all-inclusive vacation to celebrate, collaborate, slay and socialize with a few friends or for most women like me others that they had never met before. I can say first hand that pulling off any sort event isn't easy by any means. Pulling one off in a place where you haven't been, with vendors you haven't worked with, and people you don't know and seeing it be done successfully is an amazing feeling. Being part of the Baddie Boss team was one that opened me up to an experience I probably wouldn't have taken otherwise. I learned so much from talking to the others on the trip and seeing how beautiful we are inside and out reinforced my thinking of how much we have to offer the world. 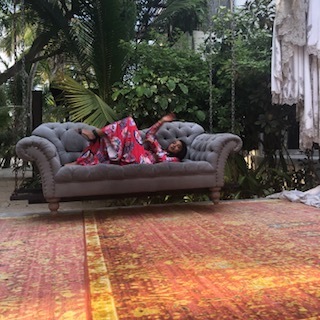 Staying at the Luxury Bahia Principe Sian Ka'an property didn't give me the opportunity to spend a copious amount of time exploring everything that Tulum had to offer. Although Tulum is small in size, there are a lot of choices of places to stay, eat, drink, and do in the city and its surrounding areas. If you're looking for all-inclusive style or high-end resort Tulum has plenty. If luxury resorts aren't your thing there are plenty lodging options that have huts or cabanas on the beach to give visitors more of a raw, natural feel. As always Air BnB's are also in abundance. 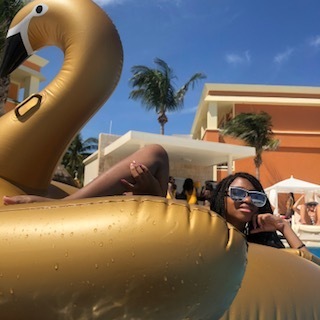 Rather going on a BAEcation or a group trip there is availability for as low as $31 a night for luxury spaces without having to stay in a hotel. When traveling I am a fan of mixing in places to eat that are blogged, Yelped and highly discussed online as well as off the road hole in the wall spots. Again staying on an all-inclusive meant I didn't really have to leave for much even if I did have the time. One place that I knew I wanted to go to was Philosophy at Casa Malca. Once the home of Pablo Escobar this luxury hotel is one of the most Instagrammed hotels in Tulum. Winding stairs, swinging couches, beach huts, and artwork make for the best backdrops. With all that being said there are better places to eat in Tulum. The menu is limited and overpriced in my opinion. If you want to visit for aesthetics and get your IG likes up stop by for pictures and enjoy a few drinks at the bar but skip dinner here. Thank me later. 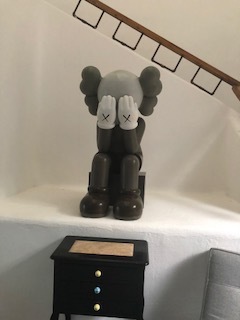 Check out my video tour of Pablo's Mansion on IGTV. Tulum is small but mighty. There are a plethora of activities to do if you for the adventurous type or self-care and relaxation galore for those needing a break. It is easy to get in enough of both if you plan accordingly. As note a lot of the luxury spas can cost you upwards of $200+ for massages and services but there are good number of affordable options such as the fish pedicure for $20. Don't forget to add cultural exhibits to your list such as the local museums and art exhibits. A list of hotels/resorts ranging from budget friendly to ball out.